September 1981 - the IBM PC ships -- early! The original IBM PC is the grandfather of today's most popular computers, which until recently were known as "IBM Compatibles" (now more frequently referred to as "x86 architecture" or "Windows PCs"). A modern Pentium II machine will still run programs written for the IBM PC more than 16 years ago. In fact, while the IBM PC bus is gradually being replaced with PCI (Peripheral Connection Interface), most modern PCs still accept ancient IBM expansion cards. Today, the original IBM PC bus is known as the "ISA", or Industry Standard Architecture, bus. This photo shows the Computer Closet's complete IBM PC system, including the system unit (bottom), monochrome display (middle), and keyboard (top). 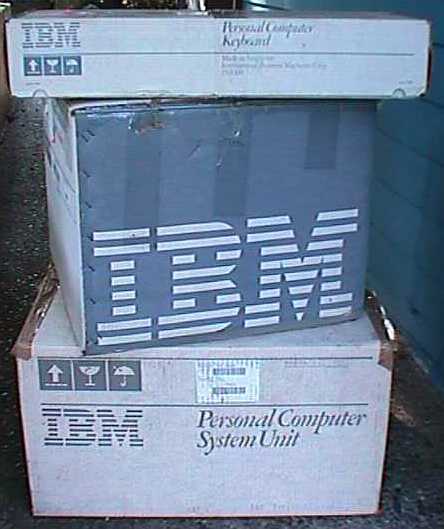 All are in the original IBM boxes. The IBM PC rapidly dominated the personal computing industry, despite some wacky marketing decisions by IBM such as licensing the Charlie Chaplin "Little Tramp" character as their advertising mascot, and the disastrous introduction of the PC's "little brother", the IBM PCjr.